I just learned that the Gryson bags are finally available at Target. If you are not familiar with Gryson handbags…Joy Gryson has worked for Coach and Calvin Klein and was most recently the Director of Design for Marc Jacobs Handbags and Accessories. Of course, the bags she designed for Target are made from PVC and not the usual supple Gryson leather; however, the leather bags retail for $600+ and the bags at Target are all under $50. 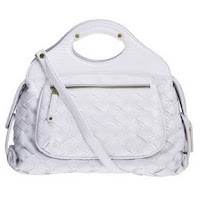 I think the white patent one with cutout handles is super cute. But, act fast – they are available at select stores and online from April 6th until June 21st.